Every crime problem is related to some location, whether it’s an address, street, or a zip code. GIS can help you pull the locational aspects of your data to analyze, understand, and build solutions to the problems you face. This is imperative during tough economic times. 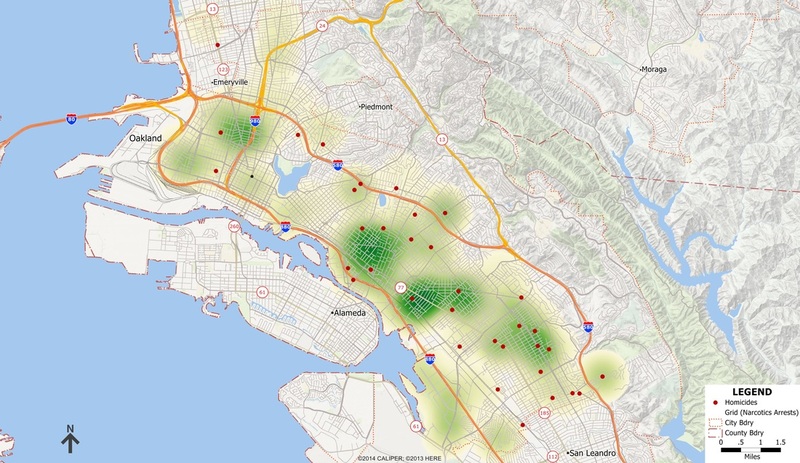 GIS can help your organization identify suspicious incidents and events that may require further investigation, support pattern and trend analysis across multiple jurisdictions, educating the public with visual information to clarify crime concerns and enlist community action, and providing tools and techniques to capture crime series and forecast future crime occurrences. This map shows homicide locations (red dots) in relation to hot spots (green areas) where there is a high concentration of arrests for narcotics. GIS can be used to see if there are strong or weak patterns and even correlations between different crime types. 2012 (Quarter 4) Crime Data courtesy the City of Oakland.